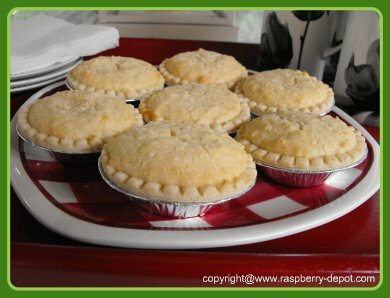 This Raspberry Tart Recipe using store purchase pastry shells, is so quick and easy to make. The fine coconut ingredient adds a very subtle coconut flavour and texture. Even those who claim they do not like coconut love these tarts! You can also decorate the top, for example with a red or green candied cherry ... what a festive tart that would make! A great Christmas Baking Idea! Spread the unbaked tart shells on a cookie baking sheet. Place 1/2 tbsp. raspberry jam in the bottom of each tart shell. In a large bowl, cream the butter, slowly adding the sugar. Add the egg, using the hand mixer to blend. Add the vanilla. Add the milk, alternating with the dry mixture. Continue to blend. Add the coconut and combine. Cover each of the jam filled tart shells with the cake mixture until filled. Decorate /garnish the top of the tarts with candied cherries, if desired. Bake tarts at 375° F for 13 - 17 minutes, or until lightly browned. Raspberries not only taste delicious, but they are nutritious too! Raspberries are very rich in Vitamin C, they are a good source of Vitamin B12, Vitamin B3, folate, magnesium, and a good source of dietary fibre. Raspberries are also high in antioxidants.